The new airberlin Business Class on short and medium-haul flights is now available for booking. From October 4, 2016, passengers can enjoy the exclusive service on airberlin flights. 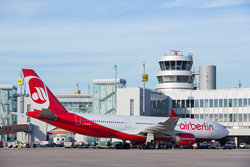 This ensures a smooth travel experience on transatlantic and connecting flights within airberlin’s short and medium-haul network. "We are delighted to offer our passengers a new product experience from next month: the new Business Class on domestic German and European flights, which connects seamlessly with the award-winning service of our long-haul Business Class. This product expansion is an important step in our progress into the premium segment of European airlines", says Stefan Pichler, Chief Executive Officer airberlin. Business Class passengers can enjoy ample legroom in the first row of seats and a guaranteed free middle seat. After a personal welcome by the cabin crew, a refreshing organic smoothie is served from popular Berlin fruit drink maker Proviant. Each passenger can choose a hot dish plus snacks and drinks from the extensive on-board menu. For added comfort, a pillow is provided for each passenger. Business Class passengers can take two items of baggage of up to 32 kg each, as well as two pieces of hand baggage of up to 8 kg each on both long, short and medium-haul flights. Business Class tickets are extremely flexible and can be rebooked and refunded free and seat reservations are also included. Additional luxuries include Priority Check-in, Fast-Track Security, access to lounges and Exclusive Waiting Areas near the departure gates around the airberlin route network as well as Priority Boarding. Tickets are on sale now at http://www.airberlin.com, from travel agents or around the clock from the airberlin Service Center (Tel: 917- 261-3165 (local rate / charges for calls from mobile phones may vary). airberlin is one of the leading airlines in Europe and flies to 131 destinations worldwide each year. The second largest airline in Germany carried more than 30.2 million passengers in 2015. airberlin offers a global route network through its strategic partnership with Etihad Airways, which has a 29.21 per cent share in airberlin, and through membership of the oneworld® airline alliance. topbonus, the frequent flyer programme of airberlin, is one of the leading programmes in Europe with more than 4 million members. The airline with the award-winning service operates codeshare flights worldwide with 23 airlines. The fleet is among the most modern and eco-efficient in Europe. Together with other airlines, airberlin belongs to Etihad Airways Partners, a new brand with which Etihad has been uniting shared activities since the end of 2014.